This list of questions and answers provides insight into board decisions during the most recent meetings. If you have further questions that you would like to see addressed here, submit your questions to the Board at board@boardgamers.org or to the Convention Director at doncon99@toad.net. See also Tenth Seat 2006, Tenth Seat 2005 and WBC FAQs. 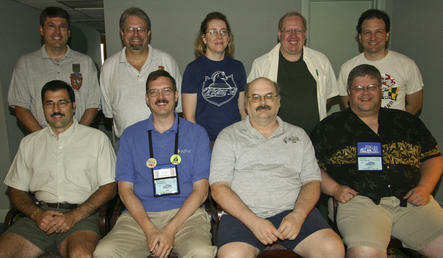 As is our custom, the BPA Board of Directors provides the following report on its 2007 deliberations. The 2007 Board Meeting was less involved than usual although not without its own unique challenges. MESE: The contentious issue that has caused most of the angst of the last few years was "solved" with a compromise that split multi-heat events into one of three newly defined variations of the old MESE category. Whether this is an improvement or not depends largely on where you stand on the wisdom of standardization vis a vis laissez-faire tournament formats. Suffice it to say that we tired of the vocal critics of the standard tie-breaker system and relented to err on the side of giving GMs more freedom to choose their own fate at the expense of the public's increased confusion in interpreting a wider array of formats. Will this make some people unhappy? Without a doubt, but it will please others and hopefully put a cap on a subject that a vocal segment has been making far too much of an issue for too long. YEARBOOKS: The big policy change this year was the decision to separate the program and yearbook into two publications and offer the latter FREE only to those Sustaining level members who joined during the December membership drive and Tribune/Sponsor members. Anyone else who wants one must pay $10 each while the supply lasts. Why the change? The Yearbook is extremely expensive to produce. Some members want it. Some don't. This way those who want it can still have it without the expense of producing it for those who don't. Mailing the book in advance has proven to cause costs far greater than just postage. Invariably, many leave them behind and then grab another on site—meaning that every year we run out so those arriving late get nothing. This will hopefully solve that problem. Combining a Yearbook with a program presented a "neither Fish nor Fowl" problem. Many wanted only information on the current schedule and found a yearbook talking about last year cumbersome and confusing. Separating that information into a separate, smaller publication devoted exclusively to the current schedule should make it easier to navigate and enable us to have enough copies to ensure that everyone gets one. At the same time, separating the books by subject matter should allow each to do its respective job better without the clutter of catering to the other task. This has been done with the realization that some care not one whit about a Yearbook and others are very fond of collecting the souvenir publication as a remembrance and record of their trip. It is an attempt to give everyone what they want with the expectation that most people who like the Yearbook are in the WBC regular camp and rejoin early anyway. For those people, little has changed. What has changed, is that those who are less inclined to care about it (generally speaking)—those who commit late—won't be getting something they tend not to care about anyway. Exceptions will occur of course and I don't expect everyone to be happy about it. But then, someone wouldn't be happy if we raised prices or did away with the Yearbook altogether either—which were our other choices. So, the plan is to mail the Yearbooks in May—a full month earlier than usual—one per household—during our annual mailing. The books will contain no schedule information for the coming WBC—enabling us to produce and mail it sooner in the year—thus encouraging folks to make their reservations earlier and resulting in less hotel issues. The program containing the schedule will not be mailed but can be accessed on line as usual. Those living outside the US and extra qualifying family members will receive theirs upon arrival as will anyone wishing to purchase one while supplies last. GM BREAKFAST: For years we've discussed ways to better prepare our GMs and to show our appreciation for their efforts. Finding a time when everyone's schedule will allow access to a common gathering has proven difficult. This year, we've decided to take the plunge and proceed with a catered GM breakfast on Wednesday morning at 7:30 AM. All participating GMs will be our guests for a free breakfast and GM seminar where we gather to go over convention rules and procedures, share war stories and answer questions about how to improve your stint as a GM. To facilitate this, organized gaming events will not begin on Wednesday until 10 AM. Attendance will be limited to 2008 GMs who indicate at least three days in advance they will attend the Wednesday breakfast and will require a ticket picked up at registration. GM VOTES: The Board voted another policy change to show our appreciation to GMs by granting each one an additional vote in elections and the following December's Annual Membership Trials vote. BPA membership votes have always been weighted by class to give Charter members and those who support the organization with longer attendance and fees a greater say in how the organization is run. The Board felt the efforts of GMs were equally worthy of this extra consideration since without them there would be no WBC. Any GM who faithfully performs his duties will be granted this voting compensation until the next WBC. serious enough about serving to be considered. Board members must contribute a fair amount of time to the governing of the organization and if one isn't willing to post a nomination form in a timely manner it doesn't speak highly of their willingness to perform more pressing duties in service to the organization. The posting of a form seems like a small enough hurdle to ask one to undertake to demonstrate their sincerity. Unfortunately, the requirement to actually post a form with an actual signature was only implied, rather than stated and in today's world, members assumed the easy way out was ok with the result that the day before the 2007 deadline, the CD received a flood of emails from candidates willing to toss their hats in the ring at the last minute— and—oh yes—Mr. CD—will you nominate me? The ease with which they entered the contest was only surpassed by the ease with which they dropped out as several rethought their position and withdrew before the ballot was finalized. The result was that there were no hoops to jump thru and the CD ended up nominating—at their request—seven candidates. serious candidates from those who might pursue it as a whim. AUCTION STORE PRE-REGISTRATION: Most of you know that our recently added Auction Store has shown great growth in its two years of existence. Too great. The volume of material that goes through the Auction Store is such that our overworked staff is working through the night to keep up with the accounting required. Consequently, if the Auction Store is going to continue we must make some changes and require that ALL lots for both the Auction and Auction Store be pre-registered in 2008. Procrastination being what it is, this will no doubt lessen the lots presented but is necessary if our staff is to be allowed to enjoy WBC too. Your cooperation in getting your lots organized and registered in advance will be appreciated.